ASU’s Global Drylands Center engages key actors of dryland stewardship to develop use-inspired research, training and solution for arid ecosystems around the world. The vision of the Global Drylands Center is to become the world leader in discovery and education ensuring a sustainable future for drylands. Drylands provide a variety of ecosystem services to support nearly one third of the world’s human population. 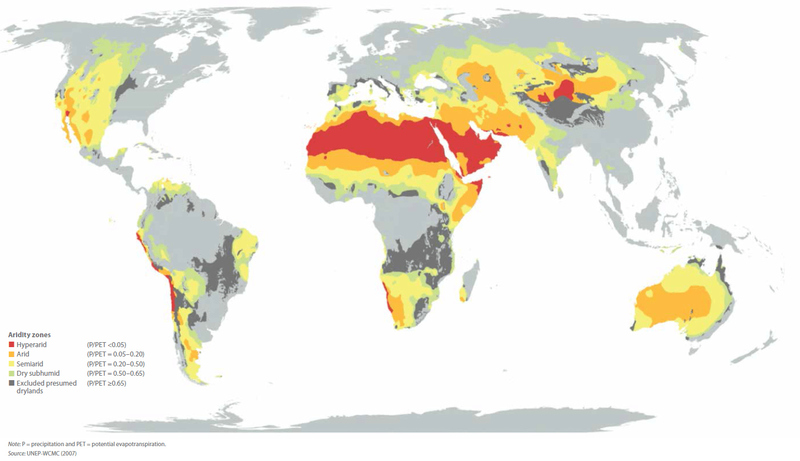 Drylands are defined by scarcity of water and limited soil moisture (Millennium Ecosystem Assessment). Drylands differ in the amount of water they receive and range in type from dry subhumid to hyper-arid. As a result, there are different biomes represented within global drylands, such as deserts, grasslands, savannahs, Mediterranean ecosystems, and even forests. The Global Drylands Center is a partnership between the Julie Ann Wrigley Global Institute of Sustainability, the School of Earth and Space Exploration, and the School of Life Sciences.